So lately I've been the total queen of lazy-girl cooking. I find myself thinking up all these elaborate recipes in my head and yet when I get into the kitchen all I want is quick, easy and healthy. Maybe it's the change of the season, maybe it's stress, but whatever it is, the easier the better. Today is a prime example of what a typical weeknight meal looks like for us. Quinoa mac and cheese, made in one pot, with only five ingredients and in under 20 minutes. Probably served with a side of greens dressed in oil and lemon juice. Yep, that pretty much sums up our dinner life these days. Oh and this recipe is also totally kid- and allergy-friendly. Not gluten, dairy, eggs, soy or nuts, but with the creamy, cheesy flavor of mac and cheese. Plus since there's broccoli, we even sneak in some healthy green veggies. 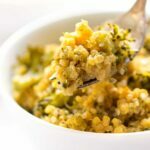 So this version of quinoa mac and cheese is a bit different than my others. For starters, you don't have to bake it. (remember, we're talkin' lazy-girl status here). You also don't have to blend anything up; the whole thing is made in just one pot. Third, it's naturally vegan, but still massively cheesy because of the nutritional yeast. side note: if you don't have any issues with dairy, you could totally sub the nutritional yeast for parmesan. And finally, it's faster. The whole things comes together in only 20 minutes, so you can have dinner on the table in no time. Friends, if you've been depriving yourself of mac and cheese because you think it's unhealthy or takes too much time to, this recipe is for you. And if you're the type of person who's feelin' real lazy one night, this recipe is going to save you. If you've been depriving yourself of mac and cheese because you think it's unhealthy or takes too much time to, this recipe is for you! 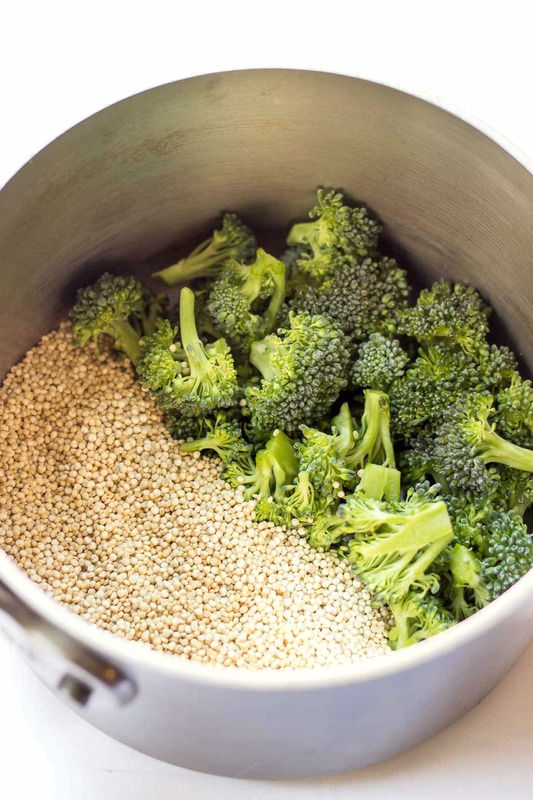 Add quinoa, broccoli, broth and water to a large sauce pan. Bring the mixture to a boil, stir and then cover and reduce to simmer for 15 - 20 minutes. 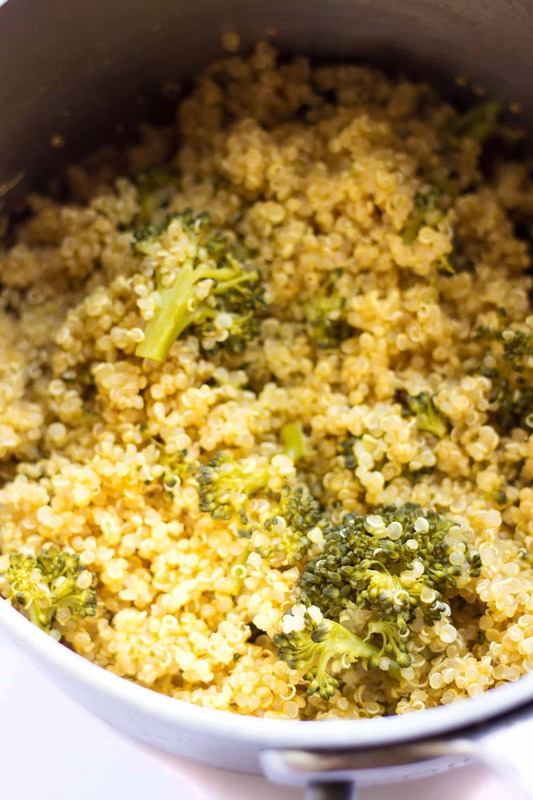 You want the quinoa to be fluffy and the water to be absorbed. 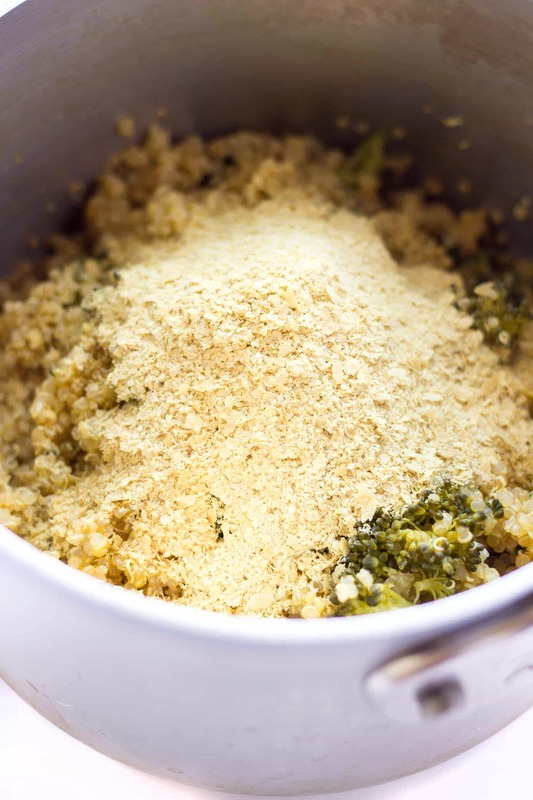 Remove from the heat and stir in nutritional yeast (or cheese). Taste and add salt and pepper if desired. I can’t say enough about this great little recipe. 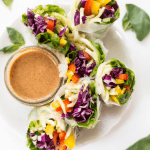 I am always on the hunt for vegetarian dinner recipes and while I find great ones, they are normally TONS of ingredients, tons of steps and a huge mess. This was one of the most simple AND the most tasty I’ve come across. Thank you for posting something that truly only took a few minutes to prep and make! I was really surprised with how well this turned out. I stirred the quinoa with the broth and water and then dumped the broccoli (and some leftover cauliflower) right on top to prevent the veggies from overcooking. They were still well done at 15 minutes, but not completely mushy, and the quinoa was done. I also think the key to it having any flavor with just the five ingredients is using a good stock and not just water. I used Imagine Vegetarian no-chicken broth and it was very flavorful. This is a perfect recipe for when you are in a hurry and don’t have anything planned ahead, or in my case, an easy meal to make when camping. Thank you! Does this reheat well? I am thinking to have it for lunch the next day. Have you ever tried it with cauliflower? I have that in the refrigerator so I just wondered! Thank you! I haven’t personally, but I don’t see why it wouldn’t work 🙂 I’d say give it a try! I’ve seriously made this 3 times in the past 2 weeks. I use Parmesan and the whole family loves it, including our 6 year old. Does it taste exactly like Mac and cheese…no. 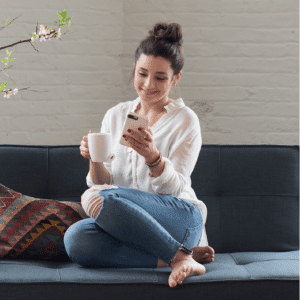 Does it matter…no. It’s cheesy in flavor, creamy in texture and packed full of good things. Thanks for the awesome recipe! Just made this for a lazy supper after getting home from work. 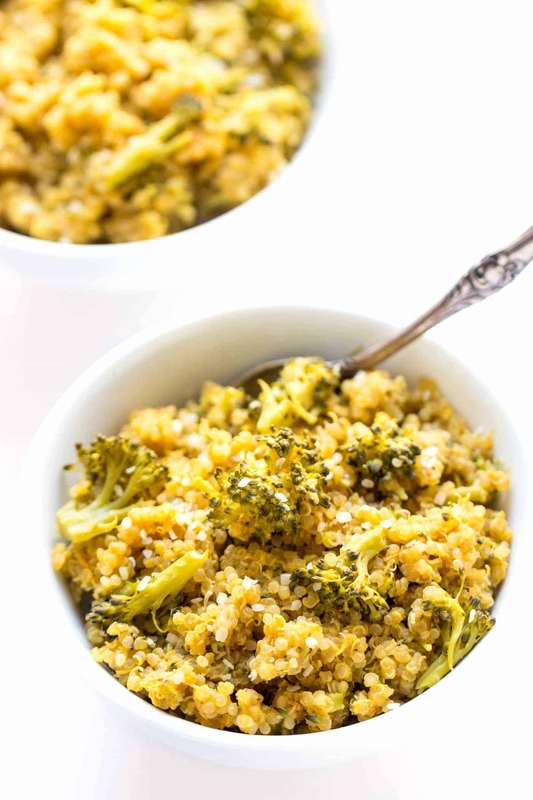 Like others, I steamed the broccoli separately instead of cooking it with the quinoa and I made mine spicy!! Added two slit thai chiles to the cooking liquid and stirred in sambal oelek and cilantro at the end. Topped with scallions and chopped jalapeno peanuts. Delicious! How many servings is the nutritional information based on? Woohoo! 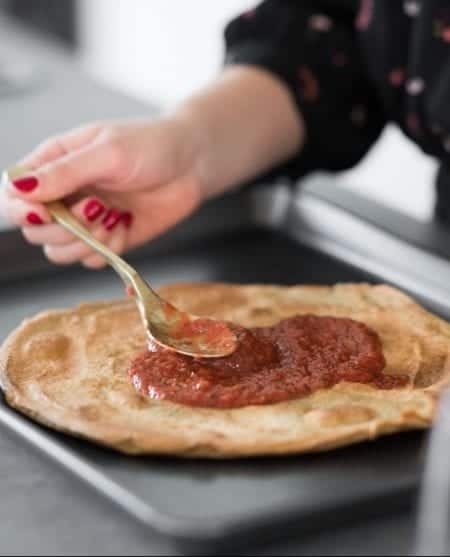 Thrilled you enjoyed it 🙂 And glad you liked the nutritional yeast – it’s such a great ingredient to use! 10/10! Even my 4 year old loved this! I opted to use cheddar cheese. I’m glad I made enough to eat it for a couple days. This looks wonderful. I can’t wait to try it. One question: I don’t see the recommendation to “wash” the quinoa before adding to the pan. 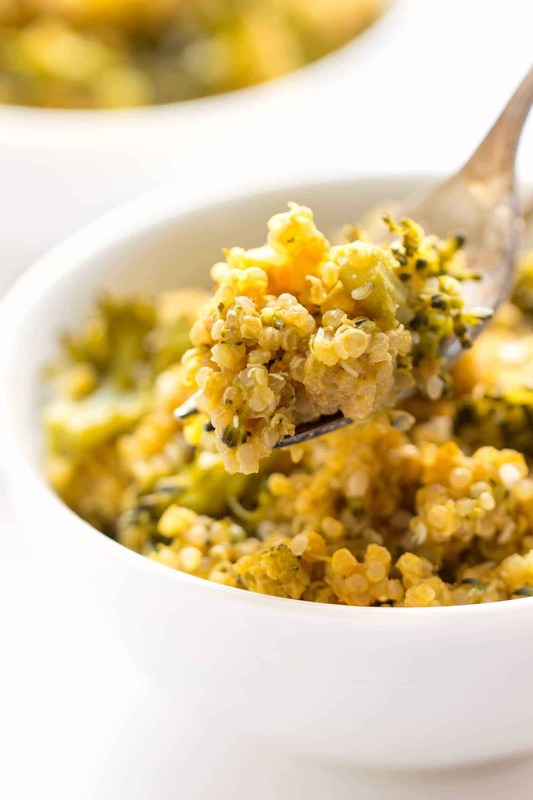 Did I miss it, or do you eliminate that step when using quinoa? Thanks! The flavor was just ok. It might benefit from some garlic and/or onion powder. But as written, we were disappointed in the final product. Sorry…. My go to meal is roasting a bunch of veggies in the oven (squash, beets, carrots, parsnips) and making an avocado toast with a poached egg. It’s so filling, easy, and tasty! I don’t go a day without avo in my diet and my brother thinks I live off avo toast. Can’t wait to try this recipe, I am not vegan but I have never experimented with nutritional yeast. Yessss healthy comfort food ftw! Mac and cheese was always my favorite food (or really anything with cheese) before I went vegan, so I love versions like this. My favorite lazy girl meal is chickpeas pancakes (1/3 cup chickpea flour + 1/3 cup water) with either a whole bunch of burrito ingredients (black beans, lettuce, salsa, guac) or jus avocado. Whaaat!? I totally gotta try that! Kind of like socca, huh? Genius! Alyssa, yes thanks for the nutritional value. My quinoa must be overcooked, never looks like yours 😉 I will be trying 20 minutes. I wonder what the nutritional yeast tastes like, maybe cheddar cheese…? Wow, quinoa mac and cheese. Looks fabulous. 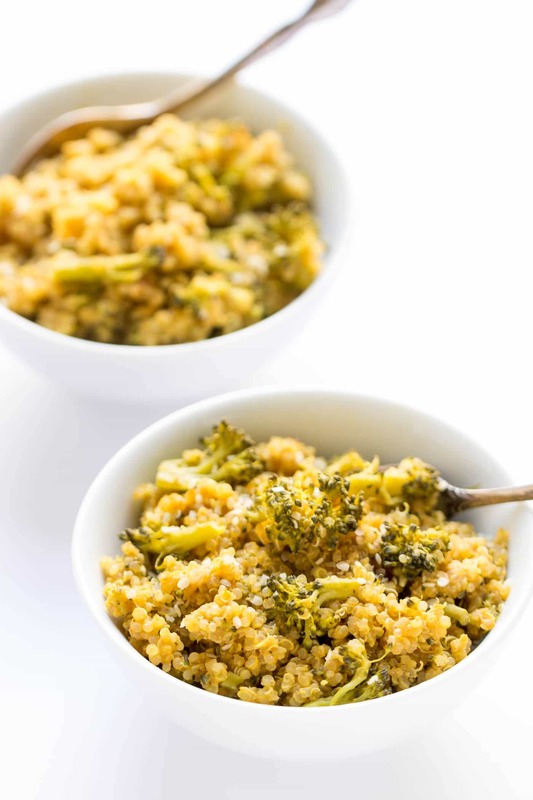 Didn’t want to simmer all the nutrition out of the broccoli so added it for the last five minutes of cooking time – came out bright green with just bit of a crunch – perfect. This was so easy to make and I had all the ingredients on hand for making it tonight!!!! So glad I opened up the email. DELISH!!!! Thank you, Alyssa. So glad you enjoyed it!! Don’t you love how easy it is? 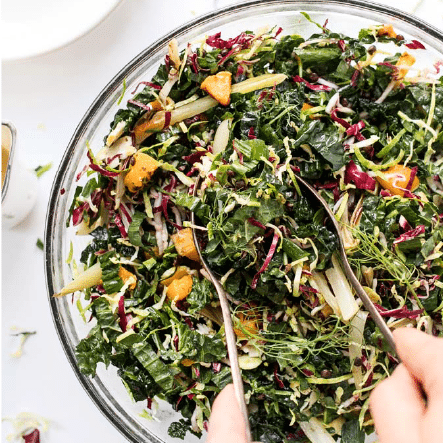 And so many ways to change it up by adding different veggies. I think spinach and peas would both be delish! Thank you Alyssa for including the Nutrition facts to the recipe. I really love this addition because I can only use recipes with nutritional facts for my assignments. When I find a recipe that is very good and does not have, I have to calculate those myself using a software. 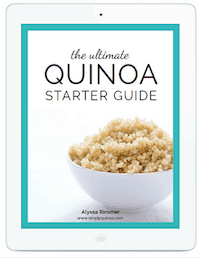 I am a second year nutritional medicine student and next year when I start clinics, I can refer clients to Simply Quinoa so they can browse through your recipes and information they need to know will be there. I have tried very few of your recipes so far for lack of time right at the moment with my study load but I have lots of them saved and on a queue to be tested and tried. Thanks once again for your wonderful work! FYI, some of us are sensitive to yeast, and can’t have either the nutritional yeast or cheese, so technically it’s NOT allergy-friendly. Appreciate the note. Feel free to sub vegan cheese if you can eat that! Did you use fresh broccoli or would frozen work? Yes! The nutritional info is most appreciated! I hope you will continue to include it with your recipes. Thank you so much for your nutrition label. I am 69 and a diabetic and many of your recipes are great for my diet. I have to be very careful about not only carbohydrate consumption but also sodium so nutrition facts are a big help. Glad you found them helpful and thanks so much for following! Thank you for including the nutritional values. This is something that I always look for with recipes. I can’t seem to find the nutritional values – can you please re-post? ?